The karaoke experience in your pocket. Remove all ads and enjoy your karaoke without advertising. Play your Chinese music with embedded lyrics support (Lyrics3v2 & ID3v2). 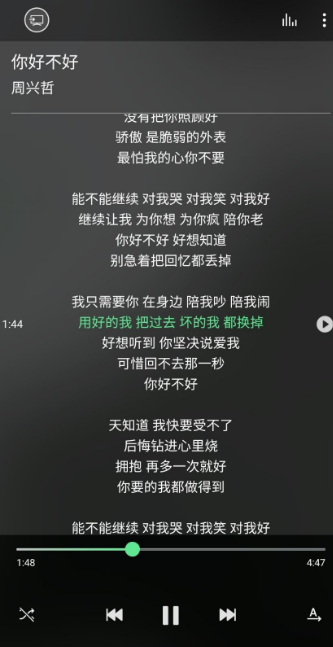 Note: Make sure the Chinese lyrics is stored in UTF-8 encoding. The lyrics (if available) will be displayed in the ‘Track Name’ field. Now supports external LRC or TXT file extension (LRC filename must be the same as the song filename). MP3 file must have ID3V2 with Tag Name ‘Lyrics’. Put your lyrics inside the tag and enjoy. Works with Minilyrics. It displays the lyrics that you added into the song file from your computer. With external synced lyrics (.lrc files), the text will scroll and synchronise with the music being play. This entry was posted on November 29, 2017 at 9:38 pm and is filed under Entertainment. You can follow any responses to this entry through the RSS 2.0 feed. You can leave a response, or trackback from your own site.